On Sunday, Eric, Bella, & I got the pleasure of seeing Yo Gabba Gabba! Live! presented by Kia Motors! Let me tell you it was AWESOME!! 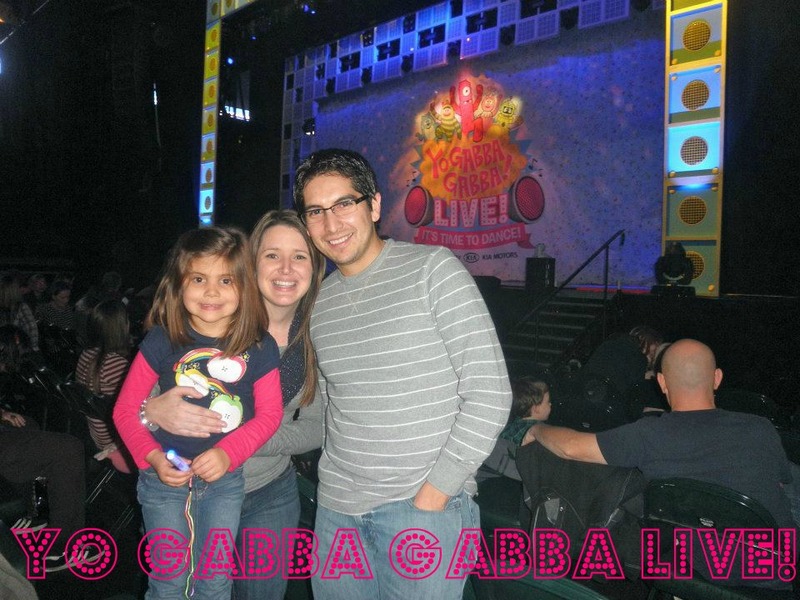 My daughter has always loved Yo Gabba Gabba, and honestly, I never really understood it, but after the show I even fell in love! It was a dance party to the fullest! Dj Lance came out and started the party off, and Bella was overly excited to see him in "real life"! She kept saying, I can't believe I get to see them all in real life!! DJ Lance on the big screen! The Whole Yo Gabba Gabba group on stage! Bella's name on the big screen during intermission! Yo Gabba Gabba! Live! is STILL TOURING!!! Go here for all the great cities Yo Gabba Gabba is going to & get your tickets today!! Great idea for a Christmas present for your children, you won't be disappointed! Disclaimer: I was given tickets to the show in order to review. I was in no way compensated for a positive or favorable review, we all just really loved the show!